1Institute of Materials for Electronics and Energy Technology (i-MEET), Department of Materials Science and Engineering, Friedrich-Alexander-Universität (FAU) Erlangen-Nürnberg, Martensstraße 7, 91058 Erlangen, Germany. 2Erlangen Graduate School in Advanced Optical Technologies (SAOT), Paul-Gordan-Straße 6, 91052 Erlangen, Germany. 3Physical Chemistry II and Interdisciplinary Center for Molecular Materials, Department of Chemistry and Pharmacy, FAU Erlangen-Nürnberg, Egerlandstraße 3, 91058 Erlangen, Germany. 4Organic Materials and Devices (OMD) Group, Institute of Polymer Materials, FAU Erlangen-Nürnberg, Martensstraße 7, 91058 Erlangen, Germany. 5Clarendon Laboratory University of Oxford, Parks Road, Oxford OX1 3PU, UK. 6Chair for Surface Science and Corrosion (LKO), Department of Materials Science and Engineering, FAU Erlangen-Nürnberg, Martensstraße 7, 91058 Erlangen, Germany. 7Institute of Micro- and Nanostructure Research and Center for Nanoanalysis and Electron Microscopy (CENEM), Department of Materials Science and Engineering, FAU Erlangen-Nürnberg, Cauerstraße 6, 91058 Erlangen, Germany. 8Avantama, Laubisruetistraße 50, 8712 Staefa, Switzerland. 9Department of Chemistry and Pharmacy, FAU Erlangen-Nürnberg, Henkestraße 42, 91054 Erlangen, Germany. 10Bavarian Center for Applied Energy Research (ZAE Bayern), Immerwahrstraße 2, 91058 Erlangen, Germany. Institute of Materials for Electronics and Energy Technology (i-MEET), Department of Materials Science and Engineering, Friedrich-Alexander-Universität (FAU) Erlangen-Nürnberg, Martensstraße 7, 91058 Erlangen, Germany.Erlangen Graduate School in Advanced Optical Technologies (SAOT), Paul-Gordan-Straße 6, 91052 Erlangen, Germany. Physical Chemistry II and Interdisciplinary Center for Molecular Materials, Department of Chemistry and Pharmacy, FAU Erlangen-Nürnberg, Egerlandstraße 3, 91058 Erlangen, Germany. Organic Materials and Devices (OMD) Group, Institute of Polymer Materials, FAU Erlangen-Nürnberg, Martensstraße 7, 91058 Erlangen, Germany. Clarendon Laboratory University of Oxford, Parks Road, Oxford OX1 3PU, UK. Institute of Materials for Electronics and Energy Technology (i-MEET), Department of Materials Science and Engineering, Friedrich-Alexander-Universität (FAU) Erlangen-Nürnberg, Martensstraße 7, 91058 Erlangen, Germany. Chair for Surface Science and Corrosion (LKO), Department of Materials Science and Engineering, FAU Erlangen-Nürnberg, Martensstraße 7, 91058 Erlangen, Germany. Institute of Micro- and Nanostructure Research and Center for Nanoanalysis and Electron Microscopy (CENEM), Department of Materials Science and Engineering, FAU Erlangen-Nürnberg, Cauerstraße 6, 91058 Erlangen, Germany. Avantama, Laubisruetistraße 50, 8712 Staefa, Switzerland. Department of Chemistry and Pharmacy, FAU Erlangen-Nürnberg, Henkestraße 42, 91054 Erlangen, Germany. Institute of Materials for Electronics and Energy Technology (i-MEET), Department of Materials Science and Engineering, Friedrich-Alexander-Universität (FAU) Erlangen-Nürnberg, Martensstraße 7, 91058 Erlangen, Germany.Bavarian Center for Applied Energy Research (ZAE Bayern), Immerwahrstraße 2, 91058 Erlangen, Germany. Among the issues facing the practical use of hybrid organohalide lead perovskite solar cells is the loss of charge carriers at interfaces. Hou et al. show that tantalum-doped tungsten oxide forms almost ohmic contacts with inexpensive conjugated polymer multilayers to create a hole-transporting material with a small interface barrier. This approach eliminates the use of ionic dopants that compromise device stability. Solar cells made with these contacts achieved maximum efficiencies of 21.2% and operated stably for more than 1000 hours. A major bottleneck delaying the further commercialization of thin-film solar cells based on hybrid organohalide lead perovskites is interface loss in state-of-the-art devices. We present a generic interface architecture that combines solution-processed, reliable, and cost-efficient hole-transporting materials without compromising efficiency, stability, or scalability of perovskite solar cells. Tantalum-doped tungsten oxide (Ta-WOx)/conjugated polymer multilayers offer a surprisingly small interface barrier and form quasi-ohmic contacts universally with various scalable conjugated polymers. In a simple device with regular planar architecture and a self-assembled monolayer, Ta-WOx–doped interface–based perovskite solar cells achieve maximum efficiencies of 21.2% and offer more than 1000 hours of light stability. By eliminating additional ionic dopants, these findings open up the entire class of organics as scalable hole-transporting materials for perovskite solar cells. Thin-film solution-processed solar cells based on a hybrid organohalide lead perovskite semiconductor have achieved certified power conversion efficiencies (PCEs) exceeding 22% (1). Early efforts to bring this technology from the lab to the market quickly revealed certain disadvantages of perovskites, including the use of toxic lead, the diffusion of ionic defects causing a hysteresis effect, long-term stability, water sensitivity, the complexity of the ink formulation, as well as the cost efficiency and compatibility of the interface materials (2–12). Of these, a critical limitation on commercializing this technology is the absence of suitable hole-transporting materials (HTMs) that offer low material costs, printability from green solvents, and full performance without sacrificing long-term stability. At present, state-of-the-art devices still use HTMs such as 2,2′,7,7′-tetrakis[N,N-di(4-methoxyphenyl)amino]-9,9′-spirobifluorene (spiro-MeOTAD) and poly[bis(4-phenyl)(2,4,6-trimethylphenyl)amine] (PTAA), and additives such as lithium salts, cobalt complexes, and 4-tert-butyl pyridine (TBP) are often used to enhance device efficiency. However, lithium salts and TBP can cause intensive degradation processes within the device. Therefore, attention has increasingly turned to the development of ionic dopant–free HTMs. Several groups have observed that stability is enhanced when dopants are either removed from the organic HTMs or totally avoided. However, all of these methods compromise device efficiency (13–15). Alternative bilayer approaches that use thermally evaporated molybdenum oxides (MoOx) have produced excellent time-zero performance but suffer from fast degradation (16, 17). Current material engineering strategies, such as adding cross-linking agents to HTMs, enhance the stability of the active material (18); however, this occurs at the cost of more complex processing and a still unsatisfactory protection of the fairly reactive MoOx against perovskite’s ionic complexes (17). In addition to stability, the costs, solubility, processing properties, and scalability of spiro-MeOTAD and PTAA are limited and do not fulfill the requirements for large-area module processing. High web speed is desired in high-throughput–processing methods such as roll-to-roll coating, and fabrication complexity is increased because of the short shelf life of doped HTM inks and the required slow oxygen-doping process (19). Carbon-based π-conjugated semiconductors have been widely investigated over the past 20 years of organic photovoltaic and organic field-effect transistor development. Many have exceeded high efficiency and/or high mobility for solution-processed lab-scale devices. The required balance between efficiency, cost, stability, and scalability of synthesis identified several of these polymers that can be scaled up to industrial volume. These low-cost and scalable polymers are the most promising alternatives to spiro-MeOTAD if they can function as stable HTMs for perovskite solar cells without ionic doping. We develop a fully solution-processed bilayer hole-extraction contact consisting of tantalum-doped tungsten oxide (Ta-WOx) and a polythiophene derivative, poly[5,5′-bis(2-butyloctyl)-(2,2′-bithiophene)-4,4′-dicarboxylate-alt-5,5′-2,2′-bithiophene] (PDCBT), which leads to perovskite solar cells with negligible hysteresis and a maximum power efficiency of 21.2%, the highest performance observed to date for perovskite solar cells with ionic dopant–free HTMs. We experimentally show that the Ta-WOx interface layer allows for a substantial reduction in the transport barrier between an electrode and π-conjugated polymers. We propose this as a universal strategy with relevance for various devices, such as solar cells, electroluminescence devices, and unipolar devices, as we consistently found this effect for many p-type polymers investigated in this study. Photoemission spectra rationalized the physical origin of this unexpected behavior. Ta-WOx further showed enhanced conductivity and a distinct density of gap states and more effectively doped interfacial p-type polymers as compared with WOx. Time-of-flight secondary ion mass spectrometry (TOF-SIMS) further revealed that Ta-WOx acted as a protective layer against the diffusion of Au into the perovskite. The absence of interface shunts is also believed to enhance the stability of the corresponding perovskite devices. Finally, in the absence of any “burn-in” effects, planar architecture devices with a fullerene-based self-assembled monolayer (C60-SAM) with strong binding between the phosphonic acid anchoring group to the oxide surface as an electron-transporting material (ETM) deliver >1000 hours of stability under continuous 1-sun illumination (where 1 sun is defined as the standard illumination at AM1.5G, or 1 kW/m2). PDCBT/Ta-WOx showed superior performance when compared with state-of-the-art doped spiro-MeOTAD, as well as ionic dopant–free polymer/MoOx interfaces. To minimize charge-carrier transport losses in perovskite-based electronics, it is crucial to reduce the energy barriers for charge-carrier injection, extraction, or transport within both electron- and hole-transporting interfaces. Moreover, to fully exploit the low-temperature–processing merit of perovskites, the processing temperatures for all interface layers are kept below 140°C (as illustrated in fig. S1) (20), which insures compatibility with large-scale printing and coating techniques on plastic substrates. We solution-processed ultrathin (~2 nm) phosphonic acid C60-SAMs as an ETM directly on indium tin oxide (ITO). C60-SAMs have been shown to not only provide fast charge extraction in combination with hysteresis-free photocurrent characteristics but also to positively influence the growth of large crystals with excellent thermal and chemical stability, making them an outstanding ETM candidate for perovskite solar cells (21). Subsequently, the perovskite absorber is deposited on top of the C60-SAM or C60-SAM/SnOx/PC60BM (where PC60BM is [6,6]-phenyl-C60-butyric acid methyl ester) substrates using a “solvent quenching” method reported in our previous work (22). Regarding the design of the HTM, we first compared thermally evaporated MoOx with solution-processed WOx, solution-processed Ta-WOx, and a control device with no interfacial layer on top of the polythiophene-based PDCBT layer. PDCBT is a polymer with a similar chemical structure to poly(3-hexylthiophene-2,5-diyl) (P3HT) and shares its advantages in synthesis and stability but has a relatively deeper highest occupied molecular orbital (HOMO) level of –5.3 eV (23). At –5.4 eV, the deeper HOMO level of PDCBT is much closer to the valence band (VB) of the perovskite with a 1.6-eV band gap. Representative current density–voltage (j-V) characteristics of these solar cells are shown in Fig. 1A, and the corresponding parameters are summarized in table S1 (20). Fig. 1 Optimization of the hole-transporting interface. (A) Comparison between the light j-V characteristic of the perovskite solar cells with different hole-extraction interfaces under AM1.5G illumination. (B) Corresponding logarithmic plot of the dark j-V characteristic. (C) Current density–voltage–luminance intensity characteristics of a device using a WOx/PDCBT contact. (D) Current density–voltage–luminance intensity characteristics of a device using a Ta-WOx/PDCBT contact. As illustrated in Fig. 1A, PDCBT/Au and WOx/PDCBT interfaces showed an S-shaped j-V curve and relatively low efficiency of 7.2 and 13.3%, respectively. These interfaces are mostly limited by a low fill factor (FF) attributed to the formation of a non-ohmic contact that impedes the extraction or injection of holes at the perovskite/PDCBT or WOx/PDCBT interface. This effect was observed in the dark j-V curves, where both devices show suppressed injection at larger bias, as observed in Fig. 1B. In strong contrast, no S-shape is observed for PDCBT/Ta-WOx and PDCBT/MoOx, suggesting the absence of large extraction and/or injection barriers for these interfaces. The Ta-WOx–based devices, in particular, reached a surprisingly high FF >75%, indicating an ideal diode behavior. An S-shape in the first quadrant typically stems from an injection barrier at the semiconductor/HTM/metal electrode interfaces. This effect can be seen more clearly in light-emitting diodes than in photovoltaic cells. Figure 1, C and D, compares the electroluminescence (EL) intensity of identical perovskite devices with a WOx- versus a Ta-WOx–based interface. Because of the wide band gap of PDCBT, we can exclude electron injection at this interface and observe enhanced EL intensity (centered at 780 nm) arising from improved hole injection at the PDCBT/Ta-WOx interface. This is the consequence of a substantially improved hole injection at the PDCBT/Ta-WOx interface (Fig. 1D). In strong contrast, when WOx is inserted into the device, current injection was reduced and EL became weaker (Fig. 1C). WOx is a deep–work function (WF) transition metal oxide with complex polymorphism and defect chemistry, making this material family an ideal platform to tune optoelectronic properties using doping strategies. When Ta was incorporated into WOx during flame spray synthesis, an additional broad visible to near–infrared (IR) absorption peak (600 to 1500 nm) occurred in the ultraviolet-visible (UV-Vis) absorption spectrum (fig. S2) (20), indicating the formation of broadly distributed doping states within the energy gap of WOx. Inks changed from light green for undoped WOx to dark brown for Ta-doped WOx (fig. S2) (20). The existence of a Ta 4f peak detected by x-ray photoelectron spectroscopy (XPS) and the absence of a Ta2O5 signal identified by powder x-ray diffraction (PXRD) implies that Ta was incorporated into the WOx host lattice (figs. S3 and S4) (20). Thus, conductivity was enhanced by almost one order of magnitude (measured on ITO interdigitated electrodes with an electrode distance of 20 μm) (Fig. 2D). Fig. 2 Effects of a Ta-WOx layer on forming quasi-ohmic contacts. (A) (Left) Photoemission cutoff spectra of WOx, Ta-WOx, PDCBT, WOx/PDCBT, and Ta-WOx/PDCBT. (Right) Valence band (VB) structure of WOx and Ta-WOx. a.u., arbitrary units. (B and C) Experimentally determined energy-level diagrams of the interfaces between WOx and Ta-WOx and PDCBT from the UPS studies and the identical optical band gap of WOx and Ta-WOx (2.85 eV) were obtained from their respective absorption spectra. The Fermi levels of the films are aligned due to the thermodynamic equilibrium that arises when they are joined together. Evac, vacuum energy level. (D) j-V curves of pristine WOx and Ta-WOx measured in ITO interdigitated electrodes with an electrode distance of 20 μm. (E) j-V characteristics of the hole-only devices with structures of ITO/PEDOT:PSS/PDCBT/Au (yellow curve), ITO/PEDOT:PSS/PDCBT/WOx/Au (red curve), and ITO/PEDOT:PSS/PDCBT/Ta-WOx/Au (gray curve). (Inset) Corresponding logarithmic plot of j-V characteristics. (F) TOF-SIMS depth profile comparing the devices with and without Ta-WOx films. Profiles were normalized based on the interfaces of the two electrodes (Au and ITO), showing the different penetration depths of Au. To further illustrate the physical mechanisms at the Ta-WOx/conjugated polymer interface, we used ultraviolet photoelectron spectroscopy (UPS) to investigate the energy levels of the WOx and Ta-WOx interfaces with PDCBT. Figure 2A shows the secondary electron cutoff region representative for the WF and the onset of the HOMO region, respectively. The WF of Ta-WOx shifted toward a higher energy by 0.2 eV as compared to that of pristine WOx (4.8 eV) and was identical to that of PDCBT within our resolution. Furthermore, as shown in Fig. 2A (left), there was a strong WF shift of 0.5 eV (reduction of WF from –4.8 to –4.3 eV) after coating a thin Ta-WOx film (under 10 nm) onto PDCBT. In comparison, the shift is only 0.2 eV for intrinsic WOx. This result implies that Ta-WOx doped the conjugated polymer much more effectively by inducing a larger hole density via transfer of electrons from the polymer to the metal oxides. Our data are in excellent agreement with previous studies outlining this mechanism in great detail but have not yet been applied to doped WOx (24–28). Also, as can be seen in Fig. 2A (right), the broad peak from 2.5 to 0.8 eV can be attributed to the gap states within the band gap of Ta-WOx and confirmed by UPS studies on transition metal oxides conducted by several groups (24–28). These gap states align well with the VB of the PDCBT layer, thus more effectively doping the polymers and offering low-loss hole-transport paths across the PDCBT/Ta-WOx interface. Such states are absent for the PDCBT/WOx interface, which is in excellent agreement with the differently colored inks (fig. S2) (20). On the basis of these findings, we deduce that the combination of pronounced charge-transfer doping and higher conductivity of Ta-WOx foster the formation of selective but low-resistance contacts. The nature of the contacts is best demonstrated with j-V spectroscopy of hole-only devices. As shown in Fig. 2E, the hole-only device ITO/PEDOT:PSS/PDCBT/Au [where PEDOT:PSS is poly(3,4-ethylenedioxythiophene) polystyrene sulfonate] presented diode-like j-V characteristics in the forward direction in the first quadrant, resembling those of a Schottky-type barrier contact for hole injection from the Au electrode into the PDCBT layer. The weaker asymmetry in the fourth quadrant indicated an additional but weaker barrier for hole extraction from PDCBT to Au. Overall, the asymmetric j-V behavior is best explained by a double-sided hole barrier at the PDCBT-Au interface, which is larger for injection than for extraction. When a WOx layer was inserted into Au and PDCBT, hole extraction from PDCBT to WOx and further on toward Au was enhanced and had an ohmic characteristic. However, the barrier for hole injection into PDCBT remained. In strong contrast, a linear j-V behavior resembling ohmic character was observed for the device structure ITO/PEDOT:PSS/PDCBT/Ta-WOx/Au. The logarithmic j-V plot confirmed the symmetry of both interfaces and indicated that Ta-WOx formed quasi-ohmic contacts to conjugated polymers with identical quality to the reference composite PEDOT:PSS. TOF-SIMS studies illustrated that the double-layer interface architecture suppressed diffusion of Au ions into and across the conjugated polymer, which otherwise would cause interface shunts and lead to an increase in leakage current and a reduction in open-circuit voltage (Voc) losses (Fig. 2F, fig. S5, and table S1) (20, 29). It is this property of the Ta-WOx layer that partially contributed to an increase in the Voc from 0.95 to 1.06 V and further reduced the leakage current to the range of 10–6 to 10–7 mA/cm2. It almost lowered the current by two orders of magnitude, which is among the lowest levels reported for perovskite-based solar cells with solution-processed interfaces. The conformal coating of Ta-WOx onto PDCBT with an ultralow root mean square (RMS) of 1.8 nm (fig. S6) made Ta-WOx a very robust barrier in protecting the perovskite from damage during electrode deposition (20). We demonstrated the universality of our approach by applying the Ta-WOx interface strategy to different polymers with a HOMO level variation from –5.0 to –5.3 eV (fig. S7) (20). We observed enhanced device performance and a high FF for all polymers upon insertion of the Ta-WOx layer. As shown in Fig. 3 and listed in table S2 (20), the Voc differences between these polymers were in line with the variation of HTM HOMO levels. Of the combined materials, PDCBT/Ta-WOx HTMs presented the best performance among these ionic dopant–free HTM architectures. We also compared PDCBT/Ta-WOx with a state-of-the-art doped spiro-MeOTAD layer and observed even better performance of the polymer/Ta-WOx architecture. Moreover, to highlight the versatility of the Ta-WOx, we then tested it in combination with undoped spiro-MeOTAD. Although undoped spiro-MeOTAD did not produce a promising perovskite device, the incorporation of Ta-WOx on top of undoped spiro-MeOTAD resulted in a reasonable PCE of 12.9%, one of the highest values reported for undoped spiro-MeOTAD (fig. S8 and table S4) (20). Fig. 3 Schematic illustration of the device architecture using various HTMs and the efficiency chart of ionic dopant–free perovskite devices. (A) Energy-level diagram showing the band levels of the perovskite and different polymers in the device. Energy levels were estimated from literature values (23, 30). (B) j-V characteristics of the perovskite solar cells with different polymer HTMs under AM1.5G illumination. (C) Efficiency evolution of regular (n-i-p) and inverted (p-i-n) structure perovskite solar cells employing ionic dopant–free HTMs (31–33). The dashed line represents the previous record efficiency of a regular-structure perovskite solar cell employing ionic dopant–free HTMs. Details are summarized in table S3 (20). Figure 4A shows the scanning electron microscopy (SEM) cross section of a planar device with a structure of ITO/C60-SAM/perovskite/PDCBT/Ta-WOx/Au. A 650-nm-thick highly crystalline perovskite absorber layer with a single grain or facet throughout the film is observed, confirming that the solar cell has a planar heterojunction configuration. The focused ion beam cross sections show the detailed features of the interfaces between perovskite and HTMs in Fig. 4B. The well-separated PDCBT/Ta-WOx HTM effectively smoothened the perovskite surface, which is consistent with the low RMS of just 1.8 nm observed using atomic force microscopy (AFM) (fig. S6) (20). We further challenged the advances of the PDCBT/Ta-WOx interface using a state-of-the-art perovskite composition, FA0.83MA0.17Pb1.1Br0.50I2.80 (where FA is formamidinium and MA is methylammonium), as the photovoltaic absorber layer. An efficiency of 19.0% was obtained for FA0.83MA0.17Pb1.1Br0.50I2.80 in a structure of C60-SAM/perovskite/PDCBT/Ta-WOx; this value is higher than the maximum PCE of 17.5% for the MAPbI3-based perovskite device. Fig. 4 Characterizations of the maximized-performance perovskite solar cells. (A) Cross-sectional SEM image of a complete perovskite device based on ITO/C60-SAM/perovskite/PDCBT/Ta-WOx/Au. Scale bar, 500 nm. (B) Corresponding SEM image of a focused ion beam polished cross section. Scale bar, 500 nm. (C) Corresponding j-V curves of the maximized-performance devices. The orange curve represents MA perovskite using C60-SAM as ETM and PDCBT/Ta-WOx as HTM, the gray curve represents FAMA perovskite–based devices using C60-SAM as ETM and PDCBT/Ta-WOx as HTM, and the green curve represents FAMA perovskite–based devices using C60-SAM/SnOx/PC60BM as ETM and PDCBT/Ta-WOx as HTM. The rate is kept constant at 300 mV/s. (D) j-V characteristics with different sweep directions. (E) j-V characteristics with different sweep speeds. (F) Steady-state output at the maximum power point (Vmpp of 0.97 V) of the best-performing device under continuous simulated AM1.5G 1-sun illumination. (G) EQE of the best-performing device and the integrated current of 22.2 mA/cm2. (H) Unencapsulated device photostability tests under continuous 1-sun illumination in a home-built chamber filled with N2. PCE variation of the HTM stacks based on a C60-SAM with a strong binding between the phosphonic acid and the oxide surface as ETM: spiro-MeOTAD/MoOx/Au (yellow), PDCBT/MoOx/Au (green), and PDCBT/Ta-WOx/Au (gray). (I) Color variation of P3HT, PDCBT, and spiro-MeOTAD single films on a glass substrate before and after I2 vapor treatment. (J) Corresponding redox potential of I–/I3– and the HOMO levels of P3HT, PDCBT, and spiro-MeOTAD. When we kept PDCBT/Ta-WOx as the HTM but inserted a compact SnOx/PC60BM layer on top of C60-SAM, the solar cells showed a drastically enhanced Voc (from 1.11 to 1.17 V), which led to a maximum efficiency of 21.2% [a FF of 0.80, a short-circuit current density (Jsc) of 22.7 mA/cm2, and a Voc of 1.17 V] combined with an excellent reproducibility (fig. S9) (20). Figure 4, D and E, confirms that the devices show negligible j-V variation under different sweep directions and scanning speeds. The rapidly stabilized maximum power point tracked PCE at 21.1%, which further suggests that the device did not suffer from a hysteresis effect (Fig. 4F). To validate the Jsc value, we also recorded the external quantum efficiency (EQE) (Fig. 4G). The Jsc integrated from the EQE spectrograms was in excellent agreement with that derived from the j-V characterization, with a discrepancy of no more than 3%. The EQE spectra of the FAMA perovskite–based device and the MA-based device present almost identical shapes in the Beer-Lambert region (from 300 to 550 nm). We observed an enhanced positive interference effect for FAMA perovskite–based devices in the cavity region (from 550 to 800 nm), which may reflect the superior optical surface properties of the FAMA perovskite composite (figs. S10 and S11) (20). In particular, by carefully comparing the EQE (fig. S12) with that of pDPP5T-2, a low–band-gap polymer HTM (20), we found that the device showed a relatively lower EQE value in the near-IR region, resulting in a short-circuit current loss of ~1 mA/cm2. Furthermore, there is a small but distinct positive contribution from pDPP5T-2 to the photocurrent at ~830 nm, where the pDPP5T-2 is photoactive. pDPP5T-2 is a strong absorber between 550 to 850 nm and filters the light, which is otherwise reflected by the back electrode. Because of the low quantum efficiency for charge generation, pDPP5T-2 contributes only negligibly but takes light away from the perovskite in the region where the perovskite absorbs. This unfavorable loss of back-reflected photons shows the advantage of wide–band-gap HTMs with an absorption ideally below 600 nm. The highly efficient devices using PDCBT/Ta-WOx HTMs not only surpass the state-of-the-art performance for both n-i-p and p-i-n architectures in perovskite solar cells employing dopant-free HTMs (Fig. 3C) but also show many combined advantages, such as negligible hysteresis (Fig. 4, D and E), excellent reproducibility (fig. S9) (20), and surprising long-term stability (Fig. 4H and fig. S13) (20). In detail, we monitored the long-term stability of unencapsulated devices under 1-sun–equivalent illumination in a N2 atmosphere using three different HTM stacks. Both spiro-MeOTAD– and MoOx-based devices exhibited short lifetimes (<200 hours) because of the drop in FF during prolonged light soaking. The rapid degradation of the spiro-MeOTAD–based device under light soaking is in good agreement with previous reports. The burn-in loss in the first few hours was mainly caused by the inactivation of the doped spiro-MeOTAD and the detrimental reaction of the TBP dopants with the perovskite. In contrast, the PDCBT/Ta-WOx–based device maintained almost 95% of its efficiency after 1000 hours under 1-sun illumination, underpinning the absence of detrimental chemical reactions for this interface architecture. Another underestimated degradation mechanism we propose is the reaction between the I2 from perovskite and the HTMs with HOMO levels of around –5.0 eV near the oxidation potential of I–/I3–. After a 2-min exposure to I2 vapor, both P3HT and spiro-MeOTAD films exhibited notable color changes, which we mainly attributed to their polaron absorption after reaction with I2. In strong contrast, PDCBT maintained its purple color unchanged (Fig. 4I), which demonstrates its robustness under I2 vapor treatment due to a lower HOMO level approaching –5.3 eV. All of these findings highlight the importance of the deep HOMO level of HTMs (Fig. 4J) in efficient and stable perovskite solar cells and lead us to properly design heterojunction interfaces for perovskite solar cells with enhanced efficiency and longevity. 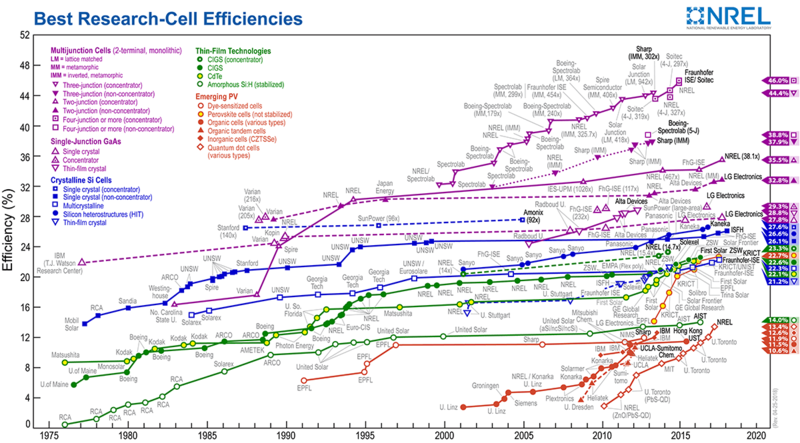 National Center for Photovoltaics (NCPV) at the National Renewable Energy Laboratory (NREL), “Best research-cell efficiencies”; www.nrel.gov/pv/assets/images/efficiency-chart.png (2017). Acknowledgments: We acknowledge funding from the SAOT at FAU Erlangen-Nürnberg, which is funded by the German Research Foundation [Deutsche Forschungsgemeinschaft (DFG)] within the framework of its “Excellence Initiative.” The work was further supported by the Cluster of Excellence “Engineering of Advanced Materials.” We acknowledge financial support from the DFG research training group GRK 1896 at FAU and from the Bavarian Ministry of Economic Affairs and Media, Energy and Technology, for the joint projects in the framework of the Helmholtz Institute Erlangen-Nürnberg for Renewable Energy (IEK-11) of Forschungszentrum Jülich. We thank O. Lytken, C. O. Ramirez Quiroz, X. Tang, S. Chen, G. J. Matt, and A. Osvet for conducting XPS, UPS, UV-Vis absorption, AFM, electroluminance, and PXRD characterizations and valuable discussions. Additionally, C.J.B. gratefully acknowledges financial support through the “Aufbruch Bayern” initiative of the state of Bavaria, the Bavarian Initiative “Solar Technologies go Hybrid” (SolTech), and the “Solar Factory of the Future” with the Energy Campus Nürnberg (EnCN). N.L. acknowledges financial support from the Emerging Talents Initiative at FAU and DFG grant BR 4031/13-1. All data are presented in the main text and supplementary materials. Tantalum-doped tungsten oxide forms nearly ohmic contacts with conjugated polymers to create efficient hole transporters.